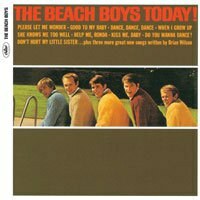 When I Grow Up: The Beach Boys - "Kiss Me, Baby"
Brian Wilson and the Beach Boys continue side two of The Beach Boys Today! with a delicate and elegant ballad about coming to terms with lost love. It would be hard to get more glowing about a song than this, but it’s also hard to disagree with him. “Kiss Me, Baby” is truly something special, and it’s because every aspect of the song from composition to arrangement to performance is so flawlessly executed. Brian Wilson wrote the song during the band's European tour at the end of 1964, either in a hotel café or a brothel, depending on whose story you trust. Regardless of the setting in which it was written, the song is one of the most interesting compositions in his entire output. Its subtly shifting chord progressions and tightly constructed melody have an elegance and powerful expressivity to them. And the arrangement just brings everything to life. Instrumentally, Wilson uses his Spector-esque set up of three guitars, two basses, two pianos, two saxophones, and percussion, as well as touches of English horn and French horn to add an orchestral flavor to the mix. But like we saw on the other side two songs, nothing feels cluttered. Wilson has figured out a way to use the expanded instrumental palate more effectively by bringing sounds in and out, rather than combining all the colors into a wall-of-sound. This sparser instrumental texture makes room for the vocals, which are some of the thickest and most beautiful harmonies the group had pulled off up to that point. An a cappella mix of the song was included on the 2001 rarities album Hawthorne, CA, which shows off the complex and lush vocals throughout the whole track, sung to perfection. The song was recorded in two separate recording sessions: the instrumental track on December 16th, 1964; the vocal tracks on January 15th, 1965. Craig Slowinski notes that, “this is probably the most historically significant track on the Today! album, simply because Brian suffered his notorious in-flight nervous breakdown between the date of the session for the instrumental track and that for the vocals.” Unlike other tracks we’ve discussed, “Kiss Me, Baby” doesn’t seem to lyrically parallel Brian Wilson’s personal life at the time, but the occurrence of his nervous breakdown before the recording of the vocals adds interesting meaning to the regret-filled lost-love lyrics. For an album whose songs are so concerned with the future—whether worrying about it or anticipating it—“Kiss Me, Baby” is an odd man out, focusing on coming to terms with the present. In that way, the song feels spiritually connected to Pet Sounds, and it helps that the composition and arrangement of "Kiss Me, Baby" also point towards the unique style that would appear on that album the following year. *"Don't Hurt My Little Sister"
*"When I Grow Up (To Be a Man)"